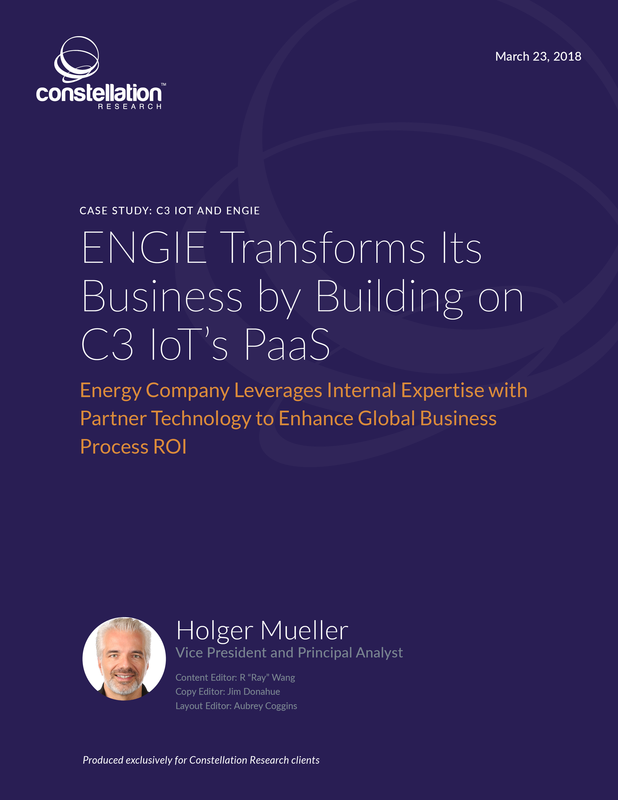 ENGIE Transforms Its Business by Building on C3 IoT’s PaaS | Constellation Research Inc.
ENGIE develops its businesses (power, natural gas and energy services) around a model based on responsible growth to take on the major challenges of the energy industry’s transition to a low-carbon economy: access to sustainable energy, climate-change mitigation and adaptation, and the rational use of resources. ENGIE provides individuals, cities and businesses with highly efficient and innovative solutions, largely based on its expertise in four key sectors: renewable energy, energy efficiency, liquefied natural gas and digital technology. A successful transformation requires fundamental process changes for both intraenterprise as well as value chain–centric best practices. Because existing platforms could not handle these requirements, ENGIE sought a next-generation platform to power new requirements. C3 IoT jointly delivered four early solutions for ENGIE, including business-to-business (B2B), business-to-consumer (B2C) and Internet of Things next-generation applications. If Not IT, Who Should Be Responsible for BYOD/ Mobility Management?